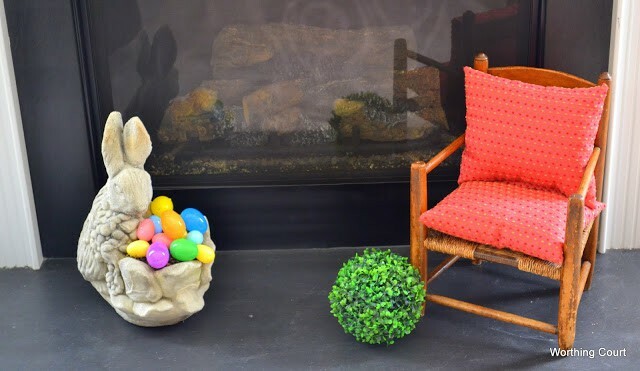 I kept the decor for my Easter mantel very simple. I painted some inexpensive clay pots white and hot glued pink and blue ribbon on. Then tied bows up under each one of the galloping bunnies. Do bunnies gallop? Me thinks not. I think these eggs from Dollar Tree are really cute. I simply clamped them shut over a length of ribbon. Easy peasy – although I will admit it was mildly annoying when a few of them kept falling off! For added interest, I brought my concrete bunny planter in from the deck and filled his little cabbage up to overflowing with more eggs. I placed him on the hearth with my antique chair, added some colorful pillows and called it done! So there you have it – my very, very simple Easter mantel. Your mantel is so cute. Perfect for Easter. Suzy, what a fun mantel! The colors are so vivid and bright! Makes me happy!! Hey Suzy…we have the same bunnies!…they are cute they way you embellished them…Love the egg garland..How utterly creative!…Cute, cute, cute!! Hi Suzy, Your mantel is simple, but very happy!! So cute. Very cute and colorful – love your mantle. How cute! Love the galloping(?)………bunnies. Where did you find them? Cute and adorable. It looks so good. Very Cute! I used those little moss bunnies from Pier One last year to make a cute little display too. So fun! I was glad to see them there again this year. I would love for you to link up to my Hippity Hop Easter Project Hop! 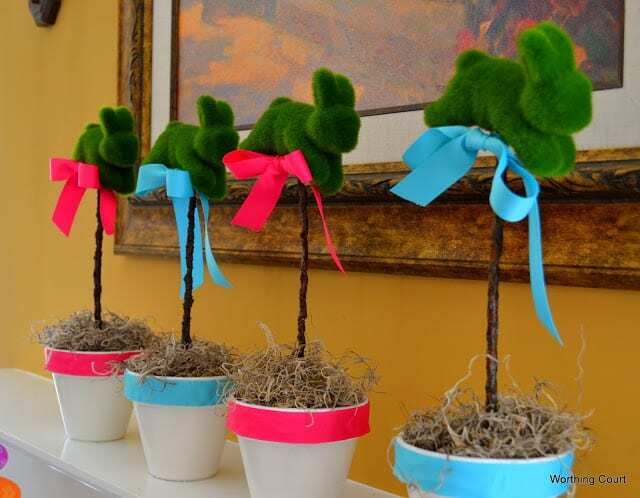 I love decorating for Easter too and I must say those topiaries are fabulous. Love things in multiples. Great ideas and thanks for sharing on this week’s BeColorful. I love the bright colors!! I could never do a banner like that, my kitty would pull it right down! Oooh I love those little bunny topiaries, how cute! I love your mantel. It is super cute with the bunny topiaries. I just love it. Thanks for sharing at DIYbyDesign. Suzy, the bunnies are adorable! Never seen a bunny topiary before! Great job! Please feel free to come over and decorate my mantel next! So cute and pretty. I would love for you to drop by My Dream Canvas as well 🙂 I’m visiting from Wow Us Wednesdays. Really like your blog. Simple and just right! What fun for kids–kids of all ages! 🙂 My favorite part is the bunny from your lawn–perfect on the hearth. Just found your blog through Grace At Home. I love that you got such a cute Easter display out of eggs from the dollar store! Just adorable. I love the galloping bunnies. So pretty! I love the bunnies! Hi, it’s my first time here. I really like the simplicity and colour of your mantle. And, just to let you know, bunnies do gallop. I should know, I spent half my teenage years galloping after one. Sheesh! Lol. 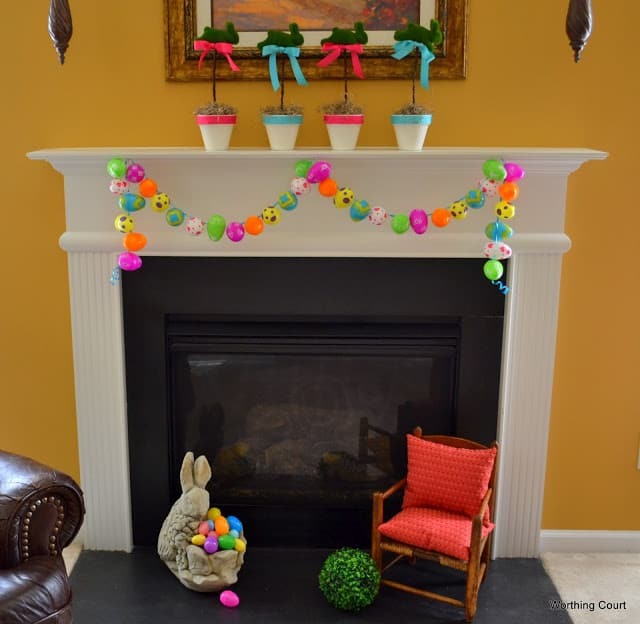 This is such a bright and fun Easter mantel! so sweet! love the little bunny hoplding all of those bright eggs! thank you for sharing! Pretty! 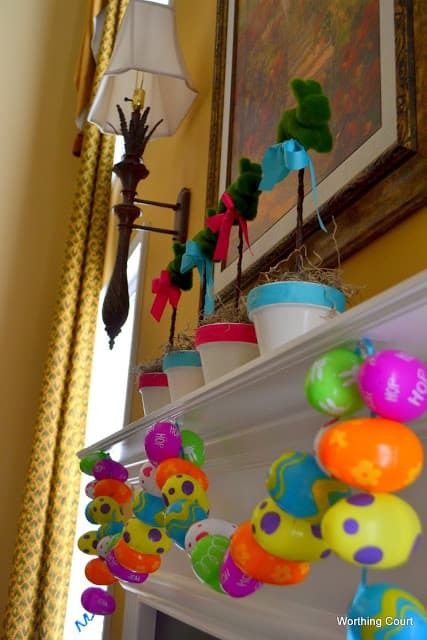 I love the egg garland! A bit late, but I just discovered your blog and was drawn to the “bunnies” tag, being a bunny-a-holic. I just bought two of those galloping bunnies on clearance at Pier 1 a few days ago, and was wondering just what to do with them — now I know! Think I’ll get a few more, since I love the repetition. 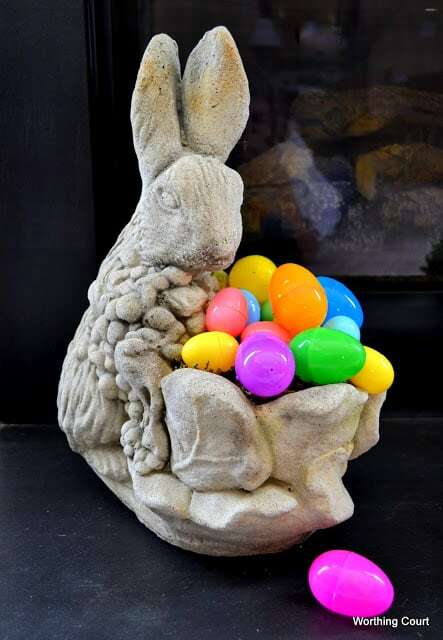 I have the same rabbit planter as you — I just usually stick an African violet in it and never thought to pile eggs in it. Thanks for the great ideas! I have a concrete bunny just like that!!! I will have to clean him up and bring him indoors!!! Great idea!